In 2017, construction is expected to regain momentum after an underwhelming performance in 2016. Just don’t anticipate an economy running like a high-performance racer. It will remain more like the “gets you where you need to go” family vehicle. A recovery now seven years and counting has moved incrementally, allowing some construction sectors to fully recover and others to move near post-recession levels. Some sectors will remain nearer to those post-recession levels than others in this new year. This time, how it felt in 2016 for construction was what it was—tempered gains (overall) as growth slowed. According to Dodge Data & Analytics, total construction starts as of September 2016 rose 1 percent ($676 billion), building off an 11 percent increase in 2015 (see Figure 1). Removing the influence of the poorly performing utility/gas plant market, growth translated to 4 percent. Breaking it down, residential grew 7 percent, nonresidential grew 3 percent, and nonbuilding fell 10 percent. Nonbuilding is public works, electric utilities and gas plants. A sharp drop from a strong 2015 among utilities—gas plants in particular—pulled down this sector. So, are we facing a period of economic weakness and decline? Dodge and others see us in a maturing but modest recovery cycle that has not yet peaked. Encouragingly, Dodge’s Momentum Index rose to 133.2 in November 2016, its 10th gain over 12 months, and another 2.9 percent to 136.7 in December, the 11th gain over 12 months. That equates to an 18 percent advance year-to-year. 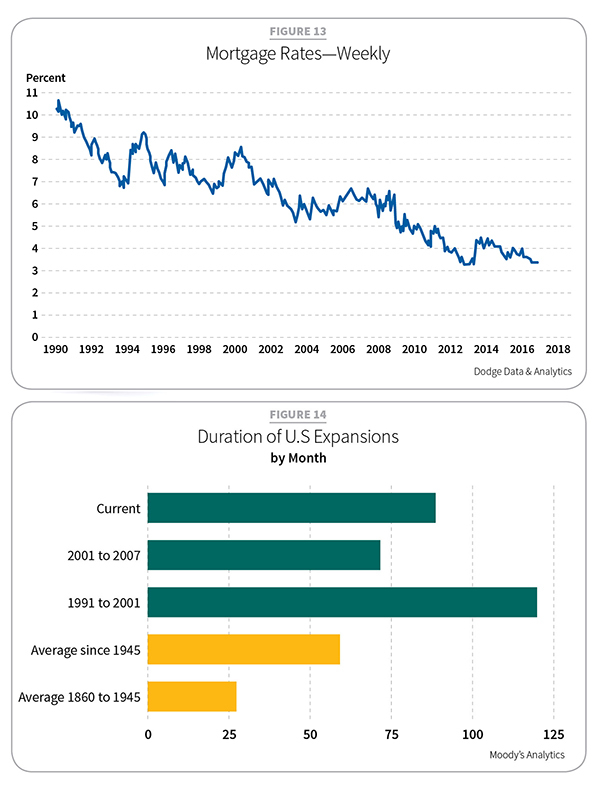 The index is a monthly measure of nonresidential construction projects in planning stages. Looking to 2017, construction starts are forecast to rise to 5 percent ($713 billion), though closer to 8 percent without nonbuilding. That equates to an 8 percent gain in both residential and nonresidential, and a 3 percent decline for nonbuilding (see Figure 2). Single-family housing may be a sector to watch. In November 2016, the National Association of Home Builders (NAHB) and the First American Leading Markets Index reported that markets in 162 of nearly 340 metro areas nationwide “returned to or exceeded their last normal levels of economic and housing activity in the third quarter of 2016. This represents a year-over-year net gain of 73 markets.” An estimated 91 percent of markets showed an improvement year-over-year. Returning to commercial activity, future growth looks a bit modest. The American Institute of Architects’ (AIA) Architecture Billings Index (ABI) showed an unexpected two-month decline in August and September, the first time since summer 2012. The decline reversed in October, improving from 48.4 to 50.8 (any score above 50 indicates an increase in billings). By December, the ABI rose to 55.9, an unanticipated jump to close out 2016. The ABI reflects the approximate nine- to 12-month lead time between architecture billings and construction spending. Where you live affects how the recovery feels. Former heavy manufacturing belts remain discouraged. A more evenhanded recovery may require deeper infrastructure spending and better support for trade education. 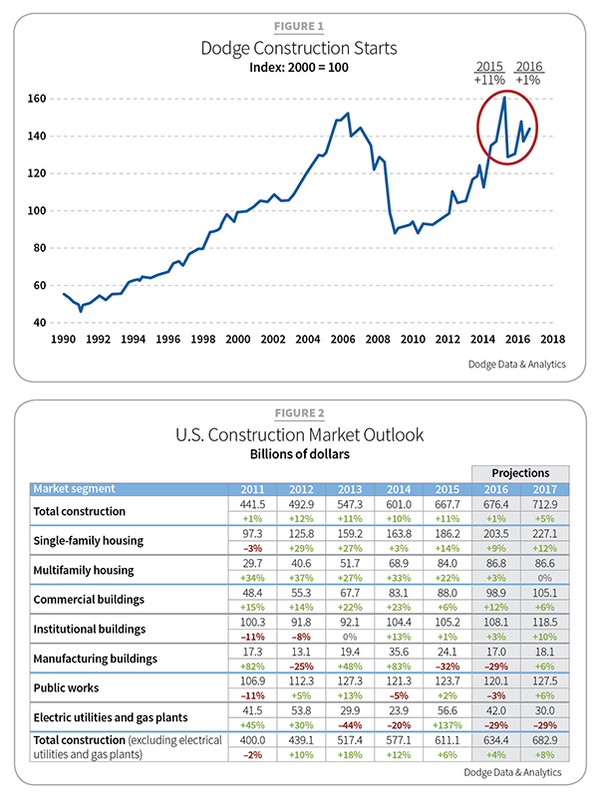 ConstructConnect (formerly CMD Group) sponsored a Nov. 17, 2016, webinar, “Post-Election Outlook for Design and Construction.” In it, forecast numbers were presented strictly as construction dollars spent (put-in-place). To factor in uncertainties, the numbers were given as a range. Of note, the U.S. Census Bureau recently reported U.S. construction put-in-place for the first 11 months of 2016 reached a seasonally adjusted annual rate of $1.182 trillion, a record high since 2006. The high end of the ranges, from webinar participants ConstructConnect, AIA and the Associated General Contractors of America (AGC), generally reflected Dodge’s numbers. Total dollar value growth projections in 2017 for these organizations are residential (5–10 percent), nonresidential (2–6 percent), and nonbuilding—roads and highways (2–5 percent) and power (5–10 percent). The Dodge Momentum Index shows an economy that is slow to recover (see Figure 3). Spending outpaced predictions from 2016’s Construction Outlook, except in the institutional category (see Figure 4). Real GDP growth was weak in the first (1.1 percent) and second (1.4 percent) quarters of 2016. Several factors—including reduced household spending, lower manufacturing demand and lower investment—played a role. Yet the third quarter landed at a revised 3.5 percent, the strongest in two years. As of this writing, fourth quarter GDP numbers were not available, but the U.S. economy is expected to grow 2.4 percent in 2017 from an estimated 1.5 percent in 2016 (see Figure 5). Speaking at the 2017 Dodge Construction Outlook conference held outside Washington, D.C., in October, Cristian deRitis, senior director at Moody Analytics, laid out behaviors and influencers shaping the economy. “Labor guides our spending and spurs investment activity,” he said. “We’ve had 73 months of job growth averaging 180,000 jobs per month. The unemployment rate is now 5 percent, a level held over the last 12 of 13 months as of October 2016 [4.6 percent in November 2016; a nine-year low]. 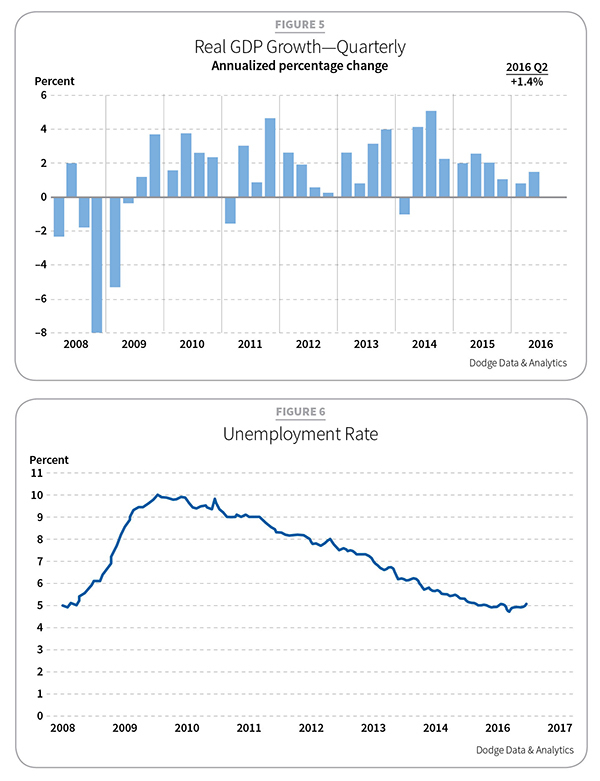 And though we should factor in the 7.5 million underemployed (discouraged or part-time), resulting in an unemployment number closer to 9.7 percent, that number is falling as well. Job growth is becoming more widespread” (see Figure 6). In other good news, average hourly earnings rose 2.8 percent year-over-year as of October 2016. That level was not seen since 2008. According to a Bureau of Labor Statistics analysis by the AGC, wages in construction grew 3 percent from July 2015 to July 2016, averaging $28.20 per hour, a 10 percent gain from the combined average pay rate of all other private sector industries. However, labor shortages remain a challenge. Of course, where you live affects how the recovery feels. Former heavy manufacturing belts and energy regions affected by low oil prices or decreasing demand for coal remain discouraged. A more evenhanded recovery may require deeper infrastructure spending and better support for trade education, especially as applied to new energy and the labor-stressed construction trades (see Figures 7 and 8). While deRitis expects to see full employment soon, the health of global economies remains a risk to the U.S. economy. Housing will help drive GDP growth in 2017, according to deRitis. “We are seeing an undersupply of housing as the market recovers from foreclosures and other stresses,” he said. “Current housing supply is 1.25 million. Demand, however, is 1.75 million.” A six-month supply of homes on the market is typically considered healthy (see Figure 9). While the trends look compelling in terms of structural changes, finding qualified labor may constrain the forecast, though remaining positive. Housing prices must also accommodate the economy as it exists. DeRitis called consumers the “engine” to the recovery. “The debt service ratio is the best since 1980,” he said. “This places consumers in a solid position to make their monthly payments and maintain better home balance sheets. These positives also help support the purchase of home and mortgage lending and other spending” (see Figures 10 and 11). 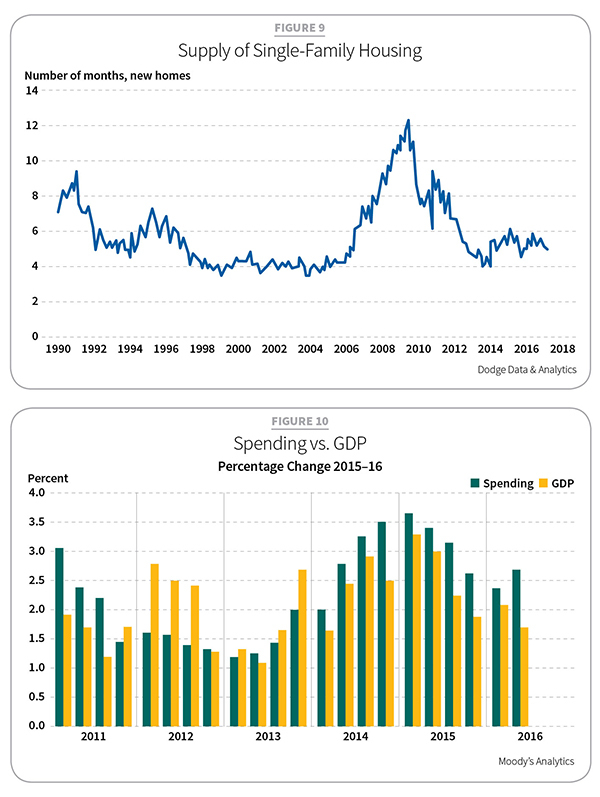 With GDP at an “all-time low,” capital spending is the lowest it has been since 1950. To that point, 2017 federal appropriations are funded through Apr. 28, 2017, and it is unclear how the new Congress and President will approach this issue. Some areas did see funding increases in 2016, including a modest increase in federal highway (5 percent) and mass transit funding (8 percent), while civil works programs enjoyed a large increase (10 percent). The General Services Administration’s new construction account tripled to $1.6 billion. However, funding decreases included a 5 percent loss for military construction and a hefty 58 percent reduction for major construction by the Department of Veterans Affairs (see Figure 12). Another possible shot for GDP growth is only an idea at this point. President-elect Donald Trump has proposed a 10-year, $1 trillion infrastructure plan that would be heavily funded by private investment with tax credits for investors. There has also been talk of an infrastructure bank. 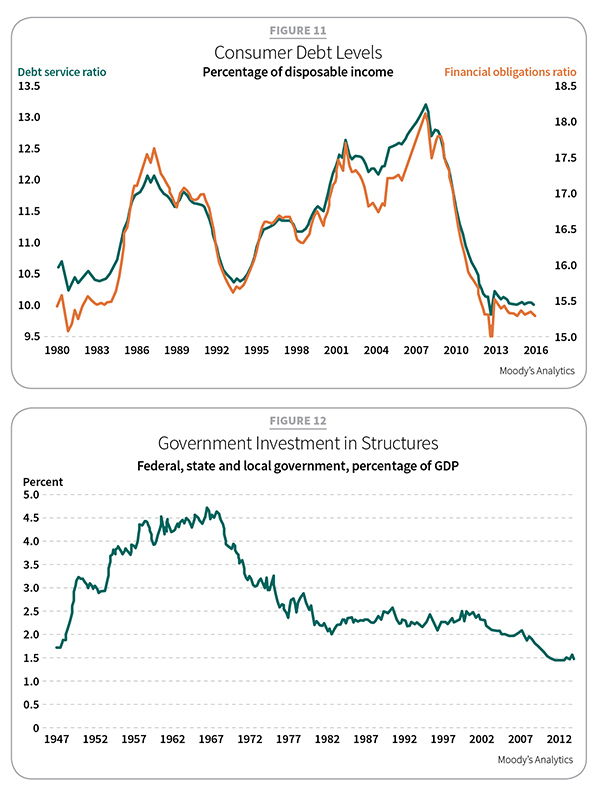 While Congress will debate levels of spending, interest in infrastructure spending tends to be bipartisan. In state funding, the National Association of State Budget Officers’ “Spring 2016 Fiscal Survey of the States” showed a 5.5 percent spending increase, the strongest growth since prior to the recession. That may brighten in 2017 based on the support for state and local construction bond measures that was seen on Election Day. According to the American Road and Transportation Builders Association, 22 states approved a total of $201 billion in transportation project funding. Significant school-bond measures also passed in several states. A number of bonds supporting affordable housing passed in cities including Portland, Ore. ($258.4 million) and Seattle ($290 million). Meanwhile, long-term interest rates remained very low in 2016. The 10-year Treasury bill stood at 1.7 percent in October 2016, and 30-year fixed mortgage rates were 3.4 percent but rose above 4.0 in December (see Figure 13). On Dec. 13, the Federal Reserve raised the benchmark interest rate by a quarter point, reflecting confidence in the strengthening of the economy and more hikes are expected in 2017. Inflation in 2016 increased a mere 1 percent. Oil prices stabilized from a fall to $28 per barrel in early 2016, to a range of $45–$50 by the third quarter. Lending constricted in 2016. After years of easing that began in 2011, the Federal Reserve’s July 2016 survey of bank lending officers saw 31 percent reporting a tightening in construction and land development loans. Forty-four percent of officers saw tougher loans for multifamily housing construction. Conversely, the Mortgage Bankers Association reported commercial and multifamily mortgages by mid-2016 were keeping pace with the previous year’s healthy advancement of 24 percent. As for talk of a recession, it’s further off than usual cycles. Tepid. Slow. Restrained. It seems we haven’t gone through a recovery quite like this before. Robert Murray, vice president, economic affairs, Dodge Data & Analytics, offered this view. “The best comparison to the current sluggish-but-steady recovery is what took place during the 1990s, which, after the 1991 recession, began very slowly but then picked up the pace due to the internet boom in the latter half of that decade,” he said (see Figure 14). 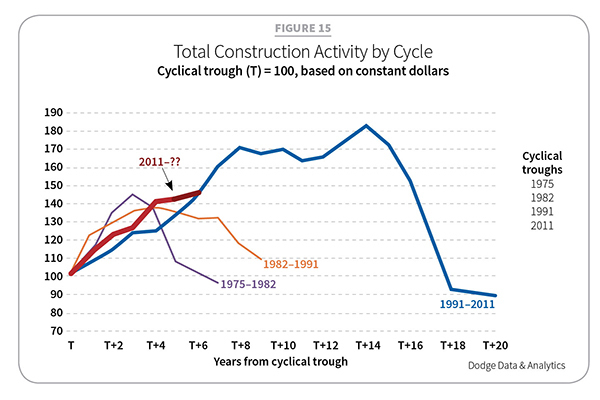 “Looking at the Dodge construction start statistics, expressed in constant dollars, total construction starts in 1996 were up 32 percent from the 1991 cyclical trough. In 2016, total construction starts on a constant dollar basis were up 36 percent from the 2011 cyclical trough” (see Figure 15). Murray said that the typical phases of a construction recovery are first led by housing, following by commercial, and then institutional. Public-sector work is influenced by federal programs. Dodge expects starts to climb 8 percent in 2017. In general, Murray expects the peaks of the current cycle to be smaller than the peaks of the prior decade. The previous peak for total housing starts was in 2005 at 2.2 million units. The next peak is expected to be 1.3 million units. For total nonresidential building, the prior peak in square footage terms was in 2007, at 1.666 billion square feet. The next peak is expected to be 1.096 billion square feet. “On a broad level, the tighter financing environment is playing the major role in keeping construction activity from reaching prior peaks,” he said. Will these forecasts be affected by the 2016 election? Speculation about the Trump administration’s impact on construction was shared by Murray; Kim Kennedy, Dodge manager of forecasting; and Richard Branch, Dodge senior economist. Beyond the favored infrastructure effort, the possible repeal and replacement of the Affordable Care Act (ACA) will inject uncertainty. Possible easing of federal regulation could also have an impact. A key drag on healthcare construction is a returning uncertainty regarding the fate of the ACA. In 2016, starts declined. The sector is expected to switchs gears in 2017, increasing 5 percent. “The plan for Trump’s initial days in office calls for lifting ‘Obama-Clinton roadblocks and allow energy infrastructure projects, like the Keystone Pipeline, to move forward,’” the analysts write. Dodge analysts added that actions taken in a president’s first year in office typically only modestly impact construction activity. In the second year, programs are in place and have more bearing. 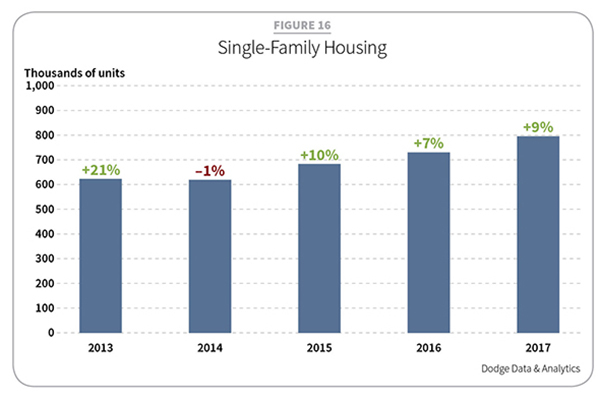 The tables may be turning as single-family growth is expected to exceed multifamily in 2017. Total housing starts in 2016 were estimated to reach 1.175 million, which is a drop but a 2 percent gain from 12 percent growth in 2015. This year, forecasts see a 5 percent advance to 1.230 million starts. In 2016, single-family starts grew to 7 percent (730,000 units). This year, starts should increase to 9 percent (795,000 units). The AGC places growth in dollars spent between 6–11 percent. Though still a far cry from its peak prerecession numbers, growth is accelerating for single-family housing (see Figure 16). Regionally speaking, single-family starts in the South-Central United States rose 4 percent. The West grew by 7 percent while the South-Atlantic rose 8 percent. The Midwest saw 9 percent growth and the Northeast 10 percent. In the first eight months of 2016, new home sales rose 13.6 percent; existing home sales rose 3.6 percent (see Figure 17). The 3.4 percent rate for 30-year fixed mortgages helped support this market. While lending standards remain tight for first-time homebuyers, some easing has been taking place since mid-2014, as reported by the Federal Reserve. More first-time homebuyers also have been able to meet down payments as reflected in the National Association of Realtors (NAR) annual Home and Buyer Generational Trend Report. Within those stats is even better news: the largest group (35 percent) now buying homes is millennials (age 35 and younger). For comparison, in home purchasing, baby boomers are 31 percent, Generation X represents 26 percent, and 9 percent comes from the “Silent Generation” (born in the late 1920s to mid-1940s). Growth in 2017 should be buoyed by progress in real wages, millennials establishing families, and low 30-year fixed mortgage rates averaging 4.2 percent. 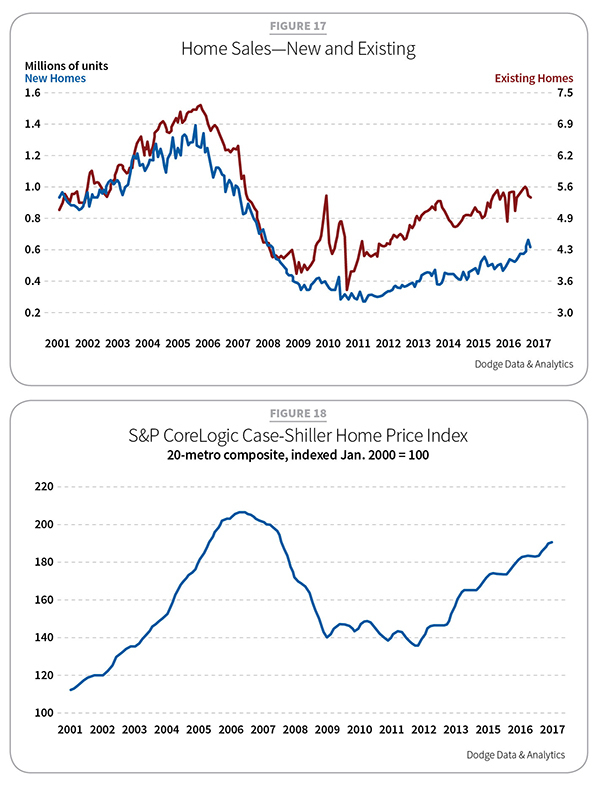 Restraints to greater growth may include higher home prices (S&P CoreLogic Case-Shiller existing home price index up 5 percent) and student debt that stands at $1.3 trillion (see Figure 18). Multifamily housing starts have been the star player during this recovery, but this sector has also matured. From 2010–2015, starts made double-digit gains from 139,000 units in 2009 to 469,000 in 2015. In 2016, this housing sector slid 5 percent to 445,000 units. The slide will continue by 2 percent in 2017, representing 435,000 units (see Figure 19). The AGC projects 2017 gains in dollars spent to range between 5–10 percent, down from 13–17 percent in 2016. Dodge estimates dollar numbers to be $86.6 billion. While multifamily may be peaking, it is far from down and out. The NAHB construction spending index revealed September 2015 over September 2016 spending was up 9.1 percent. Home improvement spending rose 4 percent. In 2015, multifamily starts in the New York metro area alone stood at $2.5 billion, representing 26 percent of the nation’s total. This dominance was triggered by an influx of foreign investment and the 2016 expiration of the city’s 421a-tax exemption program for new multiple dwellings. A proposed extension is pending. In the first eight months of 2016, New York multifamily starts fell 39 percent in units and 30 percent in dollar value. New York City has played a dominant role in multifamily activity with its large projects. There was a greater contribution from a range of metro areas. Chicago saw a 140 percent upturn in 2016. Noteworthy successes included a $780 million multifamily share of the $900 million Wanda Vista Tower in Chicago, followed by the $500 million One Bennett Park, also in the Windy City. The third largest was the $493 million Century Plaza in Los Angeles. The commercial building sector in 2016 held its own. While no longer enjoying the degree of gains from 2011–2015 (120 percent higher than recession-ravaged 2010) starts in 2016 stayed positive with a 1 percent gain (621 million square feet). Dollar value, however, was 12 percent higher. In 2017, stronger growth of 4 percent (648 million square feet) and a fiscal gain of 6 percent ($105.1 billion) are expected. The AGC predicts a range topping out at 5 percent. Last year, retail starts retreated 14 percent, representing 97 million square feet and a dollar value that fell 5 percent to $18.4 billion from 2015. This year should improve as consumer spending remains strong, supported by the expanding economy and improved housing market. 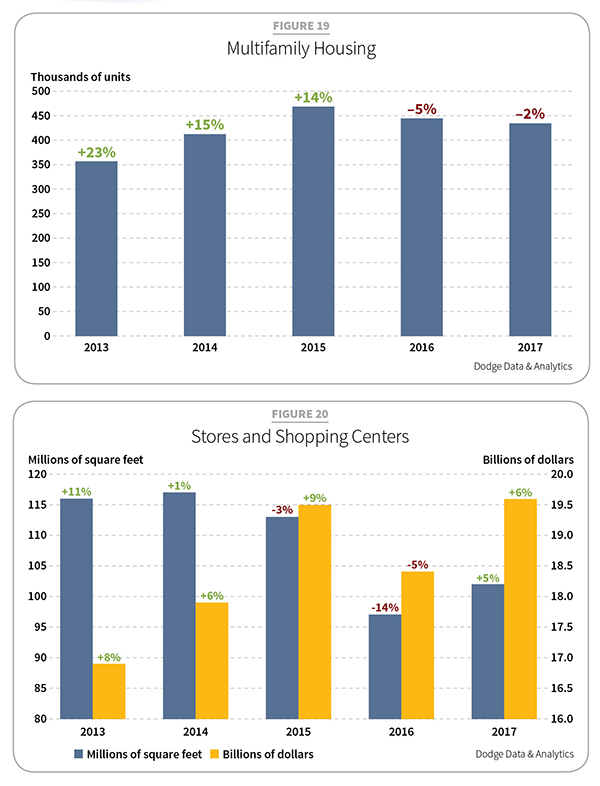 In 2017, expect a 5 percent gain in stores and shopping centers, resulting in 102 million square feet and a 6 percent dollar increase to $19.6 billion (see Figure 20). The pullback on retail construction in 2016 was the result of both weak consumer income gains and the structural changes created by online shopping (which has almost doubled in six years to just under $49 billion). Walmart has committed to smaller brick-and-mortar and a larger online presence. In the first nine months of 2016, the dollar value of its store construction starts dropped 18 percent, reducing starts themselves by 24 percent. Accounting for a large share of retail construction, Walmart is expected to be less of a drag this year. The AGC added that retail is often tied to mixed-use buildings and renovations. Large 2016 projects were the $500 million Beverly Center renovation in Los Angeles, the $140 million redevelopment of Philadelphia’s Fashion Outlets, and the $116 million retail portion of TD Garden in Boston. Someday, commercial warehouses might be rolled into the retail sector as its growth is tied to online shopping. Warehouses increased 269 percent between 2011 and 2014. This sector’s recovery is now reaching maturity. In 2016, starts grew 3 percent from 2015’s 8 percent. In 2017, gains are expected to reach 2 percent to 206 million square feet and dollar value growing 4 percent to $16.2 billion. Demand is still outpacing supply, which bodes well for 2017 new construction starts (see Figure 21). 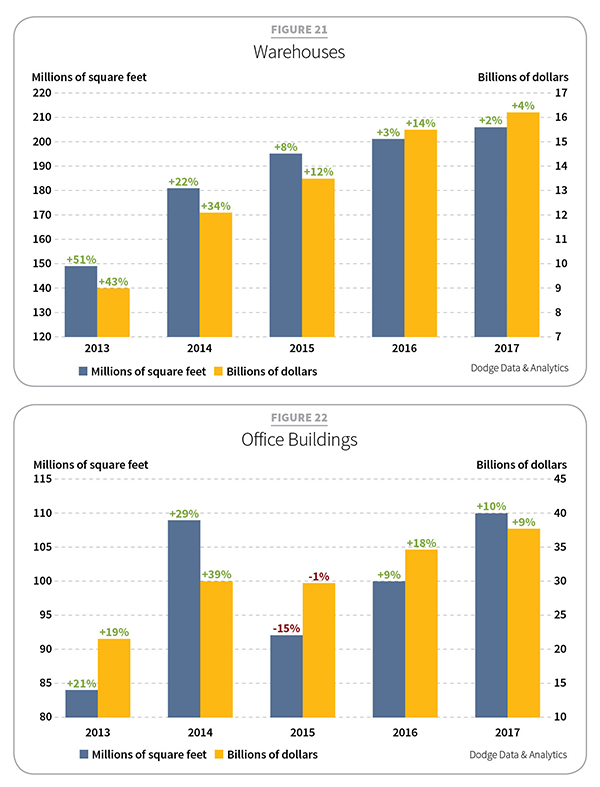 After a strong 2014 and a disappointing 2015, a comeback for office building starts has resumed. In 2016, this sector advanced 9 percent to 100 million square feet and grew in dollar value by 18 percent to $34 billion. This year, growth will gain 10 percent to 110 million square feet and rise 9 percent to $37.8 billion (see Figure 22). The AGC places dollar gains between 5–15 percent. It is expected that corporate headquarters will dominate in the coming years as companies consolidate and centralize. The expansion of cloud computing will also continue to influence office growth as more data centers will be constructed. While still a small portion of office starts, Dodge reports data centers grew 58 percent over the same period in 2015, representing 5.3 million square feet in the first six months of 2016. According to CBRE-Economic Advisors, national office vacancy rate stood at 13.1 percent in the third quarter of 2016 (see Figure 23). Of the 63 office markets tracked, rates fell in 37, climbed in 22, and were unchanged in four. Downtown vacancies increased during the same period but have been trending lower since 2010. Office space is tightening, notably in suburbia. Two of the top three projects in 2016 were part of the Hudson Yards project in New York City. They are 3 Hudson Boulevard office building ($2 billion; 1.8 million square feet) and One Vanderbilt office tower ($1.5 billion; 1.7 million square feet). Coming in third was the $400 million Supernap data center in Grand Rapids, Mich. In 2016, hotel starts grew a healthy 10 percent to 71 million square feet and 25 percent to $16.9 billion building off remarkable 2015 gains of 281 percent. After six consecutive years of double-digit growth, 2017 will see some cooling. Expect a 1 percent contraction to $70 million square feet while dollar value may inch up 1 percent to $17.1 billion (see Figure 24). A resurgence in convention center construction, a return of business travel, and an increase in legal gambling casinos have boosted the hotel market. Occupancy rates at one point in 2016 were 50 basis points better but fell. 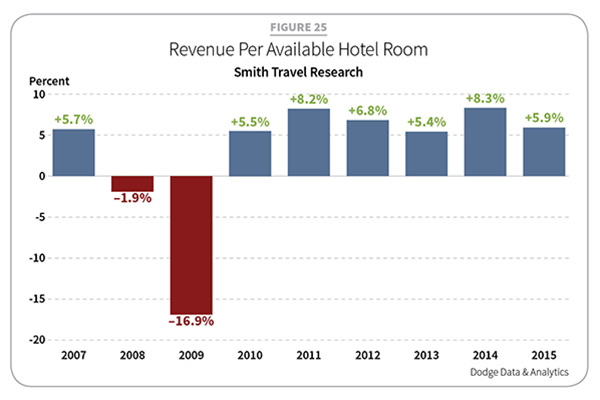 Revenue per available room (RevPAR) reflected a similar pattern. 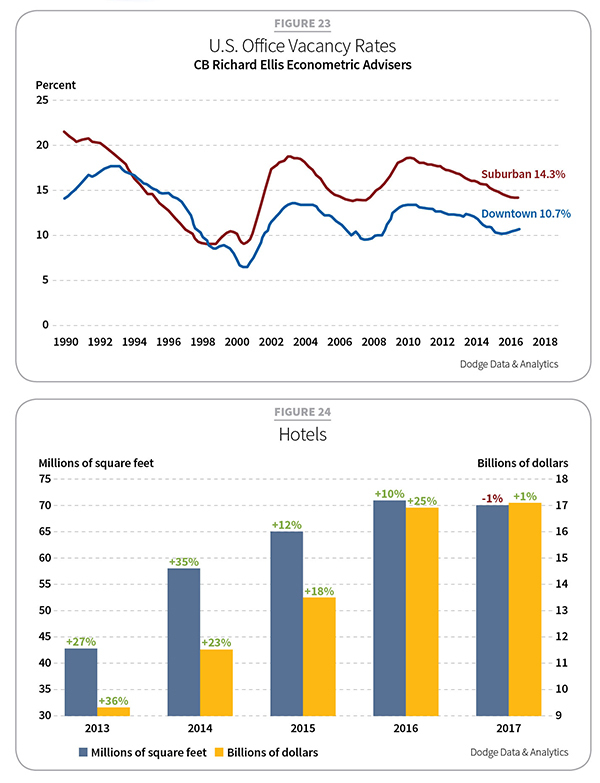 This might suggest a weakening of future hotel construction (see Figure 25). Notable 2016 projects were casinos and convention centers, such as the Wynn in Everett, Mass., a $974 million casino project with a $465 million hotel; the Montreign Resort and Casino in Kiamesha, N.Y., a $332 million hotel and $248 million casino; and the $520 million Gaylord Rockies Resort and Convention Center in Denver. Institutional building starts may see their fortunes change. Improved state and local ledgers have allowed for more confident spending, including approved bond measures late in 2016. Starts last year were down 3 percent to 291 million square feet, though dollar values inched up 3 percent to $108.1. Absent gains in 2014, six years of declines in this sector is expected to reverse, advancing 8 percent in 2017. That represents 315 million square feet and a 10 percent dollar jump to $118.5 billion (see Figure 26). Education is expected to drive institutional growth. Since 2000, it has signified 42 percent of all square footage for this market. 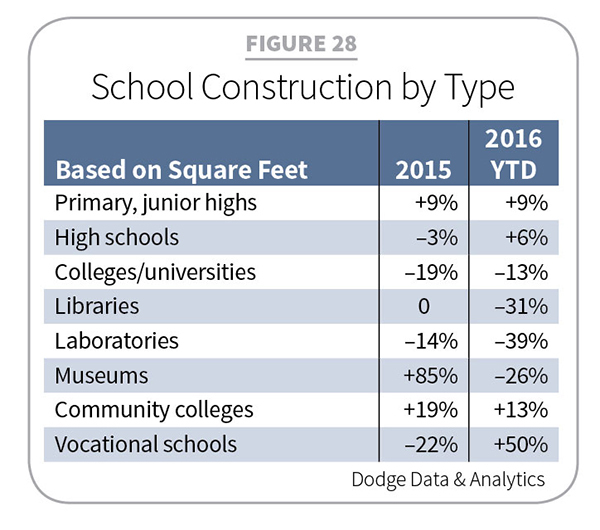 Education construction showed modest gains in 2016, growing 3 percent to 127 million square feet and a dollar value of 4 percent to $48.3 billion. 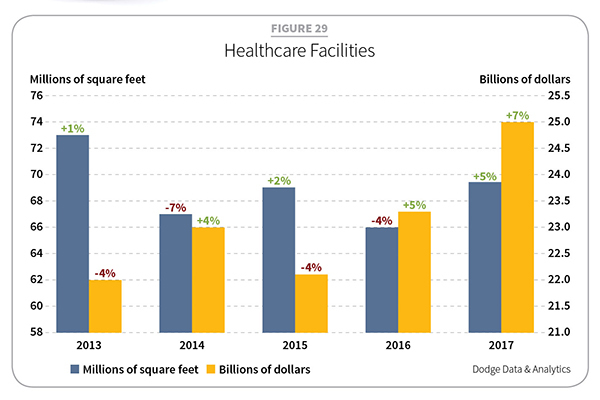 In 2017, expect further improvement as starts increase 9 percent to 138 million square feet and dollar value rises 10 percent to $53.1 billion (see Figure 27). Leveling enrollments and the Great Recession stalled education construction, which in 2001 represented 272 million square feet. Much of the recent upturn has come from K–12 projects. From 2009 through 2013, starts dropped 59 percent from 2001. The National Center for Education Statistics (NCES) found K–12 school enrollments in 2002–2009 increased less than 1 percent (446,000). The NCES predicts growth in the 2017 fall school term as children of older, married millennials are ready for pre-K and kindergarten. From 2016–2024, K–12 enrollments could increase 2.8 million students (5.1 percent) to a total of 57.9 million students. The AGC questioned whether school construction any longer matches population growth (see Figure 28), citing more children staying in cities and filling underused or charter schools. But as Dodge points out, a reinvestment in the condition of school buildings also spurs construction now that district finances have improved in many areas of the country. The 2016 election resulted in many favorable bond measures at the state and local levels. Californians approved a “$9 billion down payment” on approximately $22 billion in school-construction projects, according to state officials. Texans approved a record $669 million bond for the El Paso Independent School District and a $450 million bond for the San Antonio Independent School District. Meanwhile, large school bond measures from $125 million to $350 million passed in Colorado, Ohio and Washington. Looking at higher education, 2016 construction starts of colleges, universities and community colleges slid 10 percent from a 15 percent slide in 2015. From 2016–2024, the NCES forecasts college and university enrollment should grow to 2.69 million students (12.9 percent; a total of 23.1 million enrollees). That bests 7.2 percent growth from 2008–2016. Funding for higher education construction projects will remain a concern. A key drag on healthcare construction is a returning uncertainty regarding the fate of the ACA. In 2016, starts declined 4 percent to 66 million square feet ($23.3 billion). The sector is expected to switch gears in 2017, increasing 5 percent to 69 million square feet ($25 billion) (see Figure 29). The AGC places spending growth between 3–8 percent. A growing elderly population, aging facilities and technology will lift healthcare construction in the future. In the first nine months of 2016, 24 large projects of $100 million or more helped support this sector. These projects added 8.5 million square feet valued at $4.6 billion. Big projects included the $327 million Mount Carmel West Hospital in Columbus, Ohio; the $350 million ProMedica Hospital in Toledo, Ohio; and the $295 million Mercy Health Women/Children’s Hospital in Rockford, Ill. California spent 89 percent more in 2016 than 2015, while Texas spent 50 percent less than the year before. 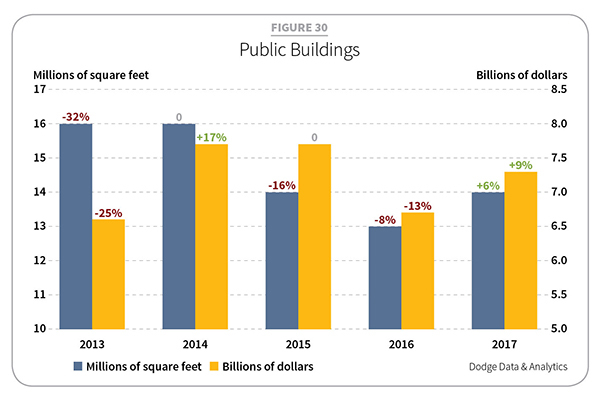 In seven of the last eight years, public- building construction has slid 73 percent in square footage. Tight budgets held back initiatives that would include capitols, courthouses, public safety (police and fire), and administrative buildings. Starts fell again in 2016 but may have bottomed out. In 2016, this sector fell 8 percent to 12.7 million square feet, for a dollar value of $6.7 billion. This year, improving fiscal and economic conditions should move starts up by 6 percent to 13.5 million square feet and 9 percent growth to $7.3 billion (see Figure 30). Top projects in 2016 included the $275 million East County Detention Center in Indio, Calif.; the $221 million Wyoming Capitol Square in Cheyenne, Wyo. ; and the $120 million renovation of the Oklahoma State Capitol. A continuing drop in churchgoing and religious affiliation has precipitated 13 consecutive years of softness in religious- building construction. In 2016, starts fell 27 percent to 7.3 million square feet with dollar values falling 26 percent to $1.5 billion. In 2017, expect a small 3 percent increase to 7.5 million square feet and a dollar value climb to $1.6 billion. 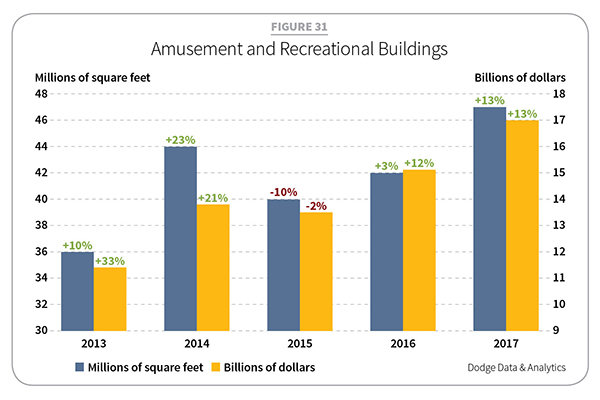 Strong performances in 2013–2014 stalled in 2015 for the amusement and recreational building sector, which gets both private and public funding. In 2016, starts grew by 3 percent to 41 million square feet and a 12 percent value gain to $15.1 billion. This year will see an appreciable advance with starts forecast for 13 percent growth expanding to 46.9 million square feet and a dollar value growing 13 percent to $17.0 billion (see Figure 31). Several large-scale projects in 2016 included the $1.9 billion NFL stadium for the L.A. Rams football team in Inglewood, Calif.; the $1.7 billion Wynn Boston Harbor Resort Casino; and the $524 million Bradley Center Arena in Milwaukee. A boost has yet to be seen from the late 2015 passage of the Fixing America’s Surface Transportation (FAST) Act. Passenger and freight terminals and storage and service buildings that affect road, rail, marine and air travel could all benefit from the five-year, $305 billion federal bill. In 2016, this sector fell 5 percent to 19.2 million square feet, though renovation projects grew in total dollar value 25 percent to $8.8 billion. Thanks to some large projects planned for 2017, estimated starts are expected to rise 12 percent to a total of 21.5 million square feet. Dollar value will rise 10 percent to $9.7 billion. The AGC is more conservative, seeing dollar value gains of 5 percent. Airport terminals are actually expected to fall by 15 percent in 2017 after rising 40 percent in 2016 (see Figure 32). Noted projects in 2016 included a $633 million renovation of the east and west caverns of Grand Central Terminal in New York City and a new $537 million North Terminal at Louis Armstrong International Airport in Kenner, La. Manufacturing construction starts have been fighting volatility on several fronts, including a drop in oil prices, cooled energy-related projects, and a strong U.S. dollar adding expense in sluggish economies for overseas buyers. A retreat for this sector began in 2015 where it dropped to 64 million square feet (18 percent) and $24.1 billion (32 percent). In 2016, starts tumbled to 58 million square feet (10 percent) and to $17 billion (29 percent). Things are looking up in 2017 as this sector attempts to regain some ground. 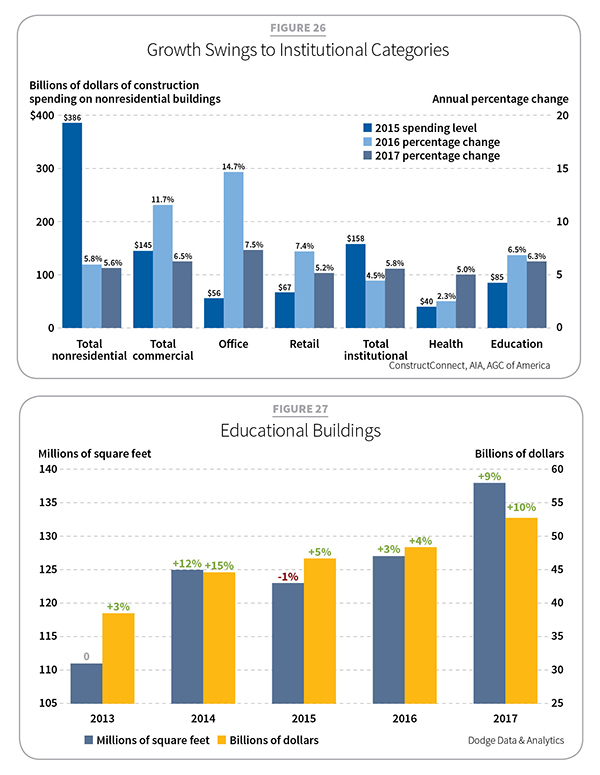 Expect growth of 7 percent to 62 million square feet and a 6 percent rise to $18.1 billion (see Figure 33). In 2016, the capacity utilization rate stood at 75 percent, holding back plant construction. While oil prices may have stabilized, the upturn won’t necessarily lead to strong petrochemical plant construction. Several projects broke ground in 2016. Three were in Louisiana: a $3 billion ethane cracker plant, a $750 million methanol plant, and a $717 million alpha olefins plant. Other noteworthy 2016 plant construction included a $900 million upgrade began on a General Motors plant in Flint, Mich., a $335 million carbon fiber plant in Moore, S.C., and a $257 pharmaceutical research lab in East Windsor, N.J. Expect improvements to come from automotive this year. In 2016, a lack of highway and bridge projects contributed to a drop in public works of 3 percent to $120.1 billion. In 2017, better funding should allow for an increase of 6 percent, driving public works to $127.5 billion. The FAST Act, the expected passage of the Water Resources Development Act, new investment in airport construction (if Congress approves a new Federal Aviation Administration bill), and bond measures ought to help generate starts. Since President-elect Trump is a proponent of additional infrastructure funding, it may increase federal spending. The 2016 election resulted in the passage of significant local bond measures. In Los Angeles, voters approved Measure M, a permanent sales tax increase of $860 million annually ($120 billion over 40 years) to fund a major expansion of the county’s public transit system. Seattle residents approved Sound Transit 3, a $54 billion initiative to add 62 miles and 37 stations of light rail by 2041 as well as more commuter trains and bus lines. Voters in Illinois passed a constitutional amendment prohibiting the Illinois Legislature from using transportation funds for nontransportation-related projects. New Jersey and Louisiana residents passed similarly themed amendments. Construction activity took a hit in 2016 after a 12 percent increase in 2015. Starts were off 10 percent, dropping to $58.8 billion. It should regain 5 percent in 2017 to $62.0 billion with stimulus from the FAST Act (see Figure 34). The AGC puts 2017 dollar growth between 2–5 percent. In some states, bond measures passed a few years back will kick in, translating into construction activity. For example, Proposition 7 in Texas is set to provide as much as $2.5 billion of funding through sales and use tax. Public-private partnerships are also on the rise. The Pennsylvania Department of Transportation announced a private firm’s $899 million proposal to replace and maintain 558 bridges over the next three years. Construction funding for environmental public works fell 4 percent in 2016 to $31.6 billion. In 2017, expect an 8 percent rise to $34.2 billion, depending on appropriations funding for fiscal 2017 and the awaited passage of the Water Resources Development Act (see Figure 35). Drilling down by project type, river/harbor development work was expected to fall 11 percent to $9.4 billion in 2016. However, 2017 will be a different story as work climbs 11 percent to $10.4 billion. Sewer construction in 2016 was expected to drop 6 percent to $11.3 billion. This year, losses will reverse with a 6 percent gain to $12.0 billion. In water supply construction, 2016 starts increased 5 percent to $10.9 billion. The momentum continues in 2017 with projected increases of 8 percent to $11.8 billion. Some noteworthy projects are the $494 million Roundout-West Branch Water Tunnel repairs outside Poughkeepsie, N.Y., and the $300 million Great Lakes National Program (sewer construction) in Chicago. Rail and mass transit projects and pipelines for oil and natural gas make up this subsector. Its performance in 2016 jumped a strong 17 percent to $29.7 billion. This year will add 5 percent to $31.3 billion (see Figure 36). Pipeline construction in 2016 tripled in dollar terms thanks to the $3.0 billion Sabal Trail, among other projects. Pipeline construction is expected to remain fairly healthy (see the AGC’s 2017 estimate below). Rail-related work continued to fall in 2016 matching 2015’s 32 percent loss. Mass transit funding under the FAST Act should help strengthen this segment in 2017. In 2016, electric power and gas plant starts fell 26 percent to $42 billion. It’s not looking much better in 2017 as construction starts are projected to decline 29 percent to $30 billion. 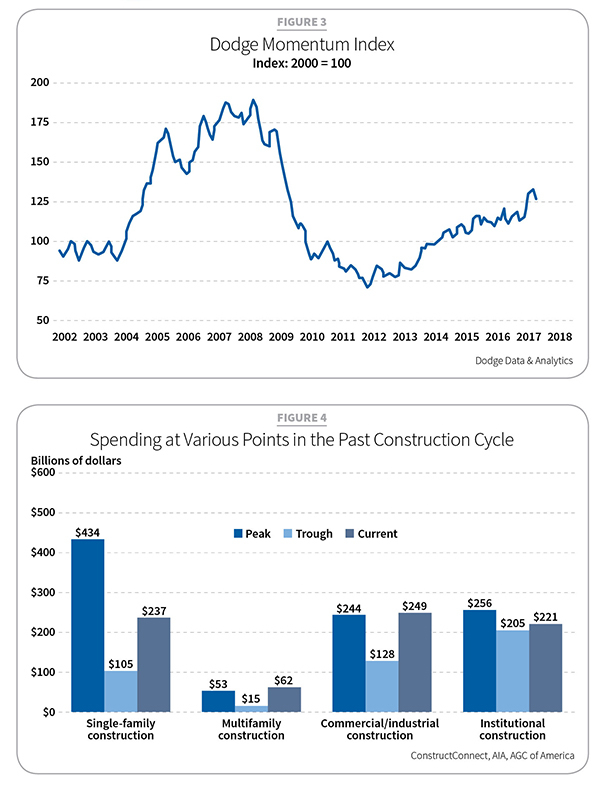 Construction spending offers better news (see Figure 37). The AGC saw 2016 dollar put-in-place grow between 3–6 percent and sees 2017 improving as much as 10 percent, including pipelines in its estimate. The performance of gas plants in 2016 was affected by an acute construction reduction of liquefied natural gas export terminals triggered by low natural gas prices. Construction fell from $26 billion in 2015 to $10 billion in 2016. Power plant projects slightly increased from $30 billion to $32 billion. Notable projects included the $3.2 billion start of the Sabine Pass Liquefaction Project in Cameron, La., and a segment of a LNG export terminal in Freeport, Texas. There is good news to share with regard to solar and wind projects. In 2016, construction of large clean-power projects began, including the $900 million Wind X wind farm in Des Moines, Iowa, and the $850 million California Flats Solar Power facility in Monterey County, Calif. A 30 percent solar tax credit was extended through 2019. The wind tax credit was extended through 2019. Its tax credit was formulated as $0.023 per kilowatt-hour and applied to closed-loop biomass and geothermal energy. The credit drops 20 percent this year. There is still fuel in the tank in an expansion yet to peak. Expect to see gains and progress of varying degrees across all construction sectors this year. With 2016’s slight growth in construction starts, and poor performance in nonbuilding, 2017 is forecast to be a better year in residential and nonresidential building. Questions remain about the new presidential administration’s effect on infrastructure, but most authorities are confident in a boost to this market. Single-family housing will be the market to watch, and, with the Fed raising interest rates for only the second time in a decade, all signs point to confidence, which may be a linchpin in GDP. Contingent on the economy, commercial construction should remain consistent with 2016, and it seems institutional is set to turn a corner this year after six years of declines. On the whole, considering some unknowns, such as Brexit and the new U.S. administration, the economy and jobs look stable. Though the recovery has been frustratingly slow, experts point to parallels in other historic recoveries, reassuring us that we’re not about to retreat into a downturn. Overall, 2017 might not feel like the Indy 500, but slower speeds also mean a crash is less likely. Jeff Gavin, Gavo Communications, is a LEED Green Associate providing marketing services for the energy, construction, and urban planning industries. He can be reached at gavo7@comcast.net.